Kudrick did work on the home’s kitchen countertops and two bathrooms, but it is the trout sink in one of the bathrooms that leaves the biggest impression. “Jeff thought some sort of physical detail in the sink would match the hunting lodge theme of the house and blend well with the textured tiles in the shower,” says Michelle Radley, managing partner for J&M Lifestyles. 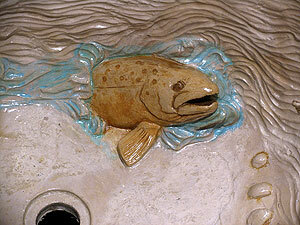 The sink, which contains three-dimensional depictions of a brook trout and a rainbow trout, was created by carving a mold from clay. 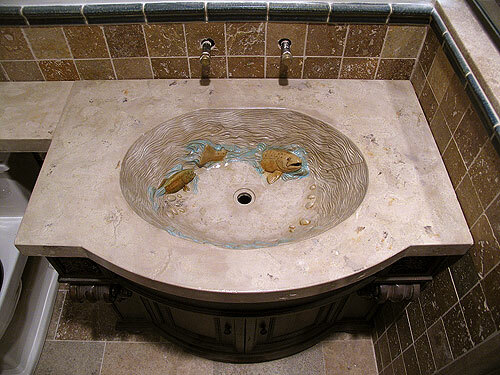 Once the water and stones were added, he decided the relief was still too boring and the sink needed imagination. Kudrick went all out, even adding a fly lure and fishing line near the mouth of the large brook trout. Because of all the detail in the sink, one of the challenges Kudrick faced was making sure water wouldn’t collect anywhere. Also, he had to make sure the mold would be strong enough to keep its shape despite the weight of the cement, but also be flexible enough to pull off and not ruin the mold. Both Radley and Kudrick say there was a lot of finger-crossing when it came time to pour the mold. But it turned out perfect. A subtle acid stain was given to the scene to give it the final touch.